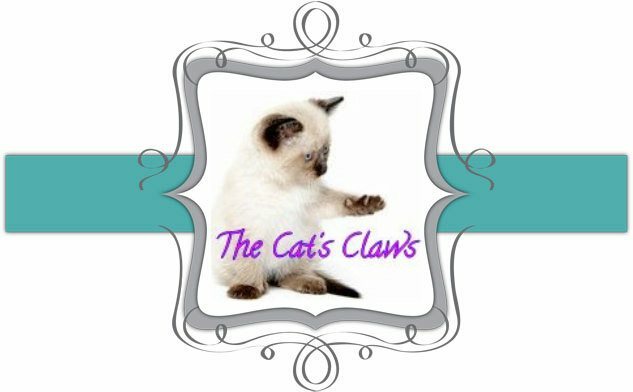 The Cat's Claws: Interruptions For An Important Rant! Its rare that I post anything here other than nail polish swatches, sometimes there is a back story to my polish travails, and sometimes not. One of the motto's that I have grown up with and believe in whole heartedly is "Stand Up and Be Counted" This motto more than any other helped me in my law career. So here is my "Stand Up and Be Counted" piece. 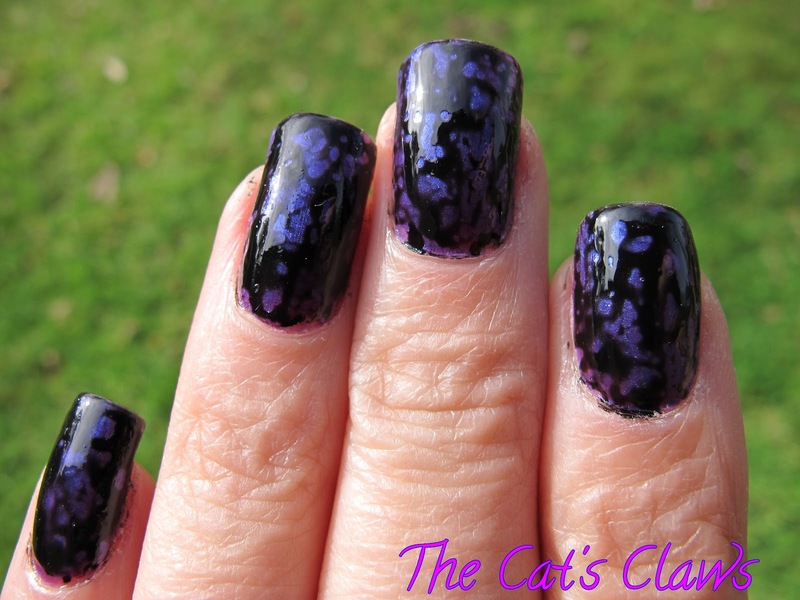 One of my friends on one of the forums and/or web page communities I belong to posted a picture of her fabulous nails in a less than stellar picture. Which unleashed a campaign of hatred and bullying. Which is having a devastating effect on her. Can you believe a grown woman can think its OK to come up with a slogan which includes "or die" and not only that but we should all clean up our manicures "or die" I mean seriously, we are talking about a manicure here a harmless, possibly frivolous, activity which gives each of us enjoyment. But more importantly that woman and her cohorts have taken it upon themselves to be both judge and jury to decide who is guilty and presumably "die" for their less than perfect manicures. In all fairness she did then post an explanation: Not a retraction or sorry but an explanation to attempt to explain away the inexplicable. So that's OK then, its not your place to call anyone out by name, BUT in your previous article before the proverbial S*** hit the fan it is OK to point out their flaws! NO a hundred million times NO. I'm sorry this is not OK and it will never be OK. I still hate this picture! I am glad you changed the first picture! 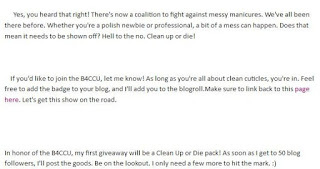 When I saw the "Clean Up or Die" logo in my feed I had a start. Thanks for your imperfect manicure. I know it threw me when I saw it on facebook, that was soooo not the look I was going for! 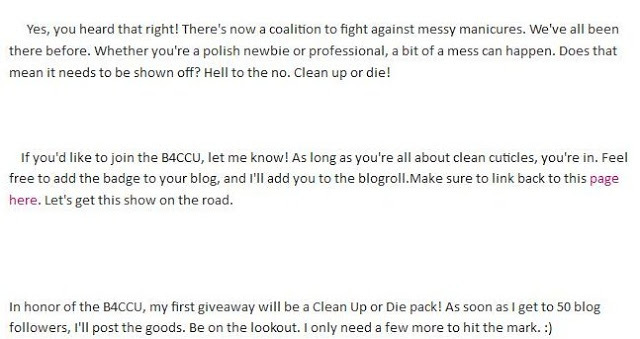 Good for you for picking the right badge for your blog. would you consider them facetious if they started a campaign say for instance "Stop being a gay or die" probably not, and neither would i.
so onto your next point, The NOH8 Campaign is a photographic silent protest showing images of people with their mouths taped, and is actually to promote equality. 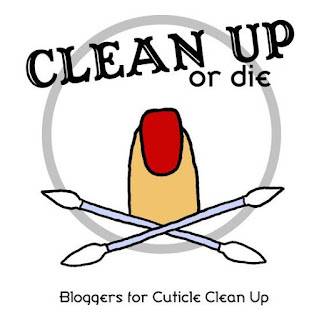 Something the nail blogging community also wish to do altho be it on a lesser scale. I can't remember if I cleaned up my manicure. I know I was in a rush to try to get mine done and submitted before the inlinkz collection closed. This sort of thing is just SO wrong. As you say, messing with our nails is supposed to be FUN, and this kind of snobbery really does make a difference to how people feel about themselves. I've seen more than one blogger stop posting because they don't feel they're "good enough." Well, to hell with that. I post my imperfect manicures, and I don't care, because I want people reading to have an idea of what the polish I am reviewing will look like on THEM, not on someone with the skills and time to make it perfect.